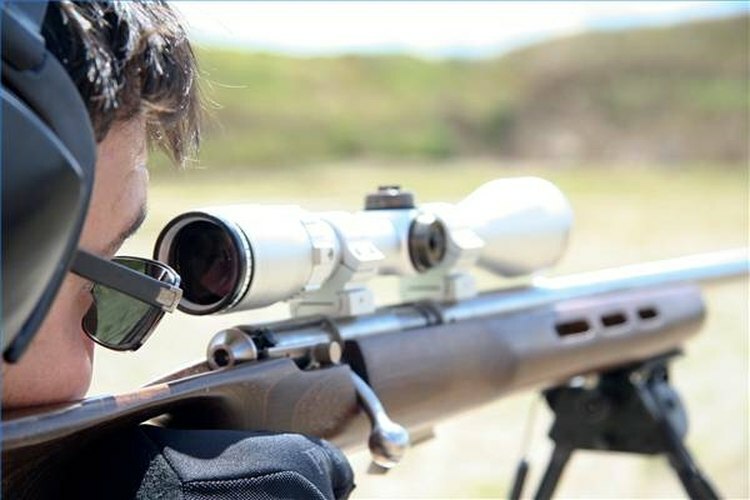 A well-mounted scope and good form, along with hearing and eye protection, aid shooting accuracy and confidence. Weaver scope mounts improve the ease with which scopes are mounted on firearms. The mount allows scopes to be removed and reinstalled without losing the aiming point, or zero. There are two parts to the Weaver scope mounting system: The mount, or base, is attached directly to the receiver; the rings clamp the scope and attach to the base. Installing the mount on a rifle is simple and safe provided the proper tools are used and proper firearm handling procedures are followed. Make sure the rifle is unloaded. Clamp the rifle firmly in a holder or vise, taking care to keep it from being marred. Remove the screws that plug the mounting holes on the top of the rifle receiver. Give each hole a quick shot of compressed air to remove any loose debris. Apply a single drop of gun oil to the screw holes. Start the tapping tool in the threads--make sure it is straight and not cross-threaded. Put the handle on the tap and go all the way to the bottom of the hole and then back out to remove any burrs left on the threads. Clean and degrease the screw holes with degreasing solvent. It is absolutely essential to remove all the oil and grease from the hole. Dry the hole when finished with more compressed air. Wipe the receiver clean of any left over debris, oil or cleaner. Dampen a rag with gun cleaning solvent and wipe the receiver clean. Apply Loctite to the threads on the mounting screws that came with the mount. Also apply Loctite to the threads in the mounting holes. Place the mount on the receiver and line up the mounting holes. Put the screws in the holes and tighten them evenly. Go back and forth between the screws, applying the same amount of pressure until they are firmly tight. Wipe away any leftover Loctite. Finish by cleaning the receiver one more time. You're ready to add the scope and sight it in. If your scope doesn't have rings yet, place the rings on the mount, add the scope and then put the other half of the rings on. After you adjust for eye relief, use Loctite on the screws that hold the rings together. Tighten evenly and don't try to remove the space between ring halves. It is supposed to be there. Much damage is done to firearms using common tools. Use only tools made for working on firearms. When choosing Allen wrenches, choose the genuine variety or those made by a reputable manufacturer. There should be no play when the tool is in the screw. If your firearm does not have mounting holes for a scope base, take it to a gunsmith and have him drill and tap the holes. He'll probably add the mount at no charge. Lack of attention to detail is probably the leading cause of scope mount failure. Be sure your scope mount is properly and securely affixed to your firearm by following instructions carefully. Wear safety glasses when using the compressed air canister and the aerosol degreasing solvent. Follow all sound firearm handling practices. Check the firearm to be sure it is unloaded. Keep the firearm pointed in a safe direction. Do not handle firearms when your judgment may be compromised, such as after consuming alcohol. Adding a scope mount to a firearm is easy enough that some people might hurry the job, resulting in wasted ammunition during sighting or a scope that fails at the worst possible moment. Take the time to do the job properly.